20, 1920 The July meeting of the W.C.T.U met with Mrs R. J. Hadley. Mrs. [Sopher?] having charge of the devotionals read from the scriptures Eph 11. The reading was followed by prayer by the leader and Mrs. Kitch. 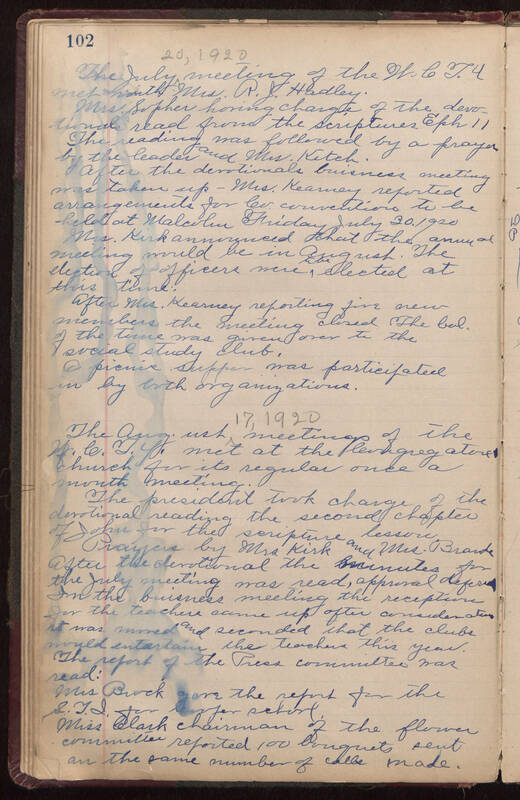 After the devotionals buisness [sic] meeting was taken up - Mrs. Kearney reported arrangements for conventions to be held at Malcolm Friday July 20 1920 Mrs. Kirk announced that the annual meeting would be in August. The election of officers were [illegible] elected at this time. After Mrs. Kearney reporting five new members the meeting closed The [Col.?] of The TIme was given over to the social study club. A picnic supper was participated in by both organisations. 17, 1920 The Aug.ust [sic] meetings of the W.C.T.U. met at the Congregations church for its regular once a month meeting. The president took charge of the devotional reading the second chapter of John for the scripture lesson. Prayer by the Mrs Kirk and Mrs. [Brarde?] After the devotional the minutes for the July meeting was read, approval defered. In the buisness meeting the reception for the teachers came up after consideration it was moved and seconded that the the clubs would entertain the Teachers this year. The report of the Press committee was read: Mrs Buck gave the report for [acronym?] for [l?] [s?] Miss Clark chairman of the flower committee reported 100 bouquets sent an the same number of calls made.